Avenger over New Zealand, Yak-55, Yak-18T, DC-3 Paint, by Alex Mitchell. 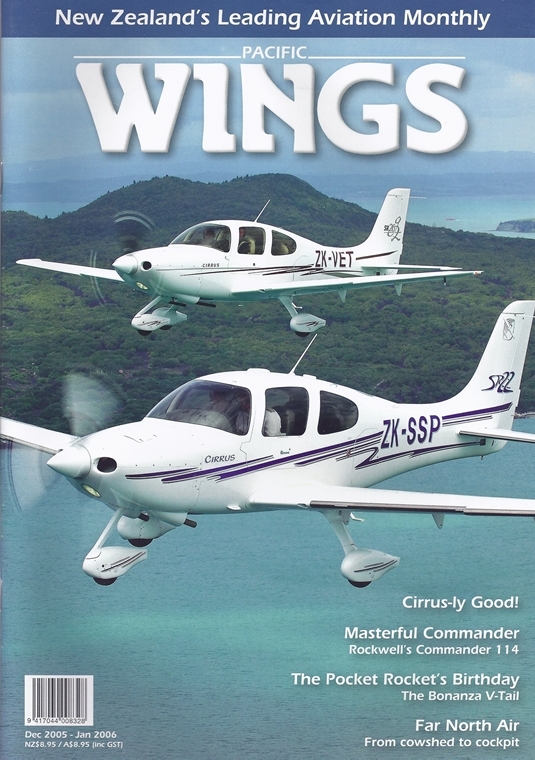 The writing is most certainly on the wall for manufacturers of old technology light aircraft; as Rob Neil discovered, the writing is in loud, bold letters three feet high, and it says… CIRRUS! Distinctive in design and performance, the V-tail Bonanza is a classic GA aircraft in every sense of the word. But despite 17,000 airframes produced over 60 years, only a handful of these exquisite aircraft have made the journey to New Zealand. Wings correspondent Andy Heap recently flew one of the few - Keith Neylon's V-35B, ZK-EDJ. Rob Neil takes a look at a delightful four-seat single, not common in new Zealand skies, and discovered its talents match its stylish good looks. The RNZAF hosted an aerobatic training weekend for warbird pilots at Ohakea recently, and the chance for those attending to learn from New Zealand's professional aerobatic display pilots was a rare and privileged one. Stephen Witte attended what proved to be an invaluable and enlightening ""workshop."" Why would an apparently sensible and successful dairy farmer wish to exchange the pleasant working environment and convivial daily contact with several hundred milk-laden bovines (not to mention the lucrative nature of the business) for the noisy confined space of a Fletcher FU24 cockpit? It is a fair question actually, and one that Mike Feeney provides an explanation for in this profile of the present owner of the aerial topdressing company started by Jim Summerfield.